Looking for kids' birthday party games? Children as young as two will enjoy playing a game of Blow the Duck Down the River. Sometimes, the most simple party games are the most fun. For this one, you’ll only need drinking straws, rubber duckies (or any floating plastic toy that fits your party’s theme), long narrow plastic containers and water. You can set up the game so that two players compete against each other at a time, in which case you’ll only need two ducks and two plastic containers. If you’d like all the players to compete at the same time, you’ll need enough containers and ducks for everyone. Keep in mind, if you choose the latter route, it might be difficult to determine which player won the race. Fill the plastic containers with water. Set them on a table that’s an appropriate height for the players (a coffee-table height for young kids; a dining-table height for older ones). Place the plastic containers near the sides of the tables so the players can follow their ducks down the river. Give each player a drinking straw and a duck and instruct them to stand at one end of their plastic container. 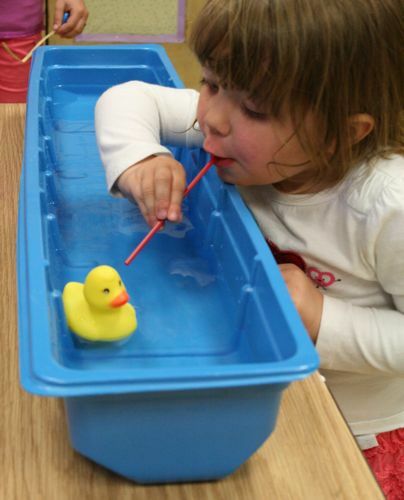 On the count of three, the players must place their ducks in the water and start racing them down the “river” by blowing into the drinking straw. The player whose duck reaches the end first wins. Be sure to give each child a fresh drinking straw so as not to pass germs. Also, consider how you can adapt this game to fit your party’s theme. If you’re hosting an under-the-sea party, use plastic fish instead of ducks. If it’s a modes-of-transportation party, use plastic boats. The possibilities are endless. Finally, let the kids keep their ducks or another plastic toy as a party favor once the game is over.